Christmas markets are fun, but the big department stores have lots to offer and great decorations! The major department stores of Paris—Printemps, Galeries Lafayette, Bon Marché, and BHV (Bazar de l'Hôtel de Ville) are huge, with a great variety of clothing, accessories, household goods, and other items to buy. At Christmas time, these stores go all out, with fantastic window displays and beautiful decor inside the stores as well. Window displays may include bowers of roses overhead, animated mannequins dancing and singing, snow falling, visitors from other planets, and more. Work your way to the front of the crowds and enjoy the show. Inside the stores, displays of clothing and other items may be decorated with ribbons and ornaments, making the whole store seem festive. 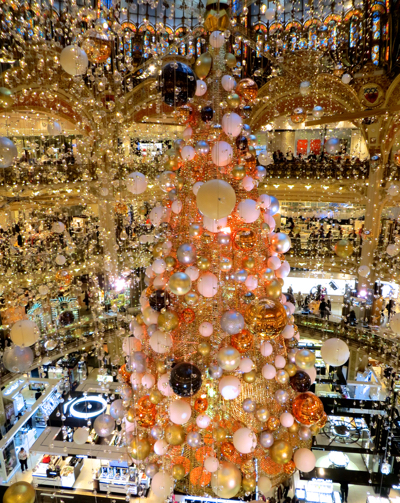 One of our favorites is the suspended Christmas tree under the stained glass dome in Galeries Lafayette. The dome itself is worth a visit at any time of year, but add the decorations and it's stunning. The dome rises over about five floors of the store, leaving a large open area in the center. With dangling decorations on each floor surrounding the center, it makes quite a display. Admiring the Galeries Lafayette tree from the 5th floor. You might also want to have lunch or tea at the Brasserie Printemps, in the Printemps store. Here you are seated under the glorious dome, with mirrored tables allowing you to enjoy it from all angles. The Christmas tree in the middle just adds to the enjoyment. 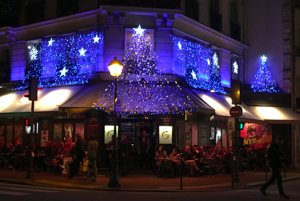 Printemps and Galeries Lafayette are both on Boulevard Haussman, near the Opéra Garnier, within easy walking distance of each other (map). BHV, as its name implies, is just across from the Hôtel de Ville (map), while Bon Marché, best known for its food and culinary products (as well as high fashion), is on the left bank, not far from Saint-Germain (map). Even if you're not into shopping, it's worth a visit to these fine old stores to see the beautiful decorations. Above, Star-lit displays at the BHV. 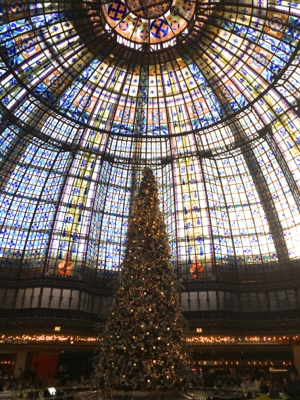 Below, The lovely Christmas tree below the stained glass dome in Brasserie Printemps.